Beginner, new runners or experienced runners, all should know how to breathe while running long distances. Deep belly breathing, nose or mouth breathing, proper breathing techniques there are so many things which you should know as a runner. As a runner you should have an idea about all this as it will help you a lot to improve your breathing techniques while running. With proper breathing you can improve your running a lot. Effective long distance running is a combination of running with correct posture, following proper breathing techniques, taking proper diet, doing core running exercises etc. All this will make your running very effective as well as enjoyable. As a long distance runner you should adopt deep belly breathing technique. The deep belly breathing helps us to use the entire capacity of lungs. The oxygen intake is also higher which helps you to remain more energetic and fresh. 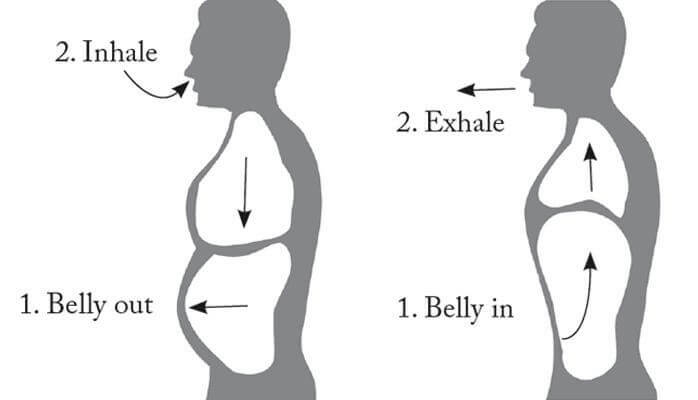 Learn how to do belly breathing: Belly breathing is simple to learn and practice. Here are a few steps for it. Lie down on a mat on floor or on a bed and put your hands or a light book on your stomach. Breathe deeply and inhale and exhale. Check that your hands or book on your stomach should rise when you breathe in and fall as you breathe out. In this kind of breathing you should breathe deeply. A little bit of practice will help you to breathe like this. There is always remaining confusion how one should breathe while running. It always makes sense to breathe through your mouth while running. Mouth breathing is considered as the best method for breathing while running. The reason is that such breathing brings in more oxygen than breathing through the nose. The more oxygen you get the more energetic you will feel. In long distance running, you will find it tough to get enough oxygen through your nose after running substantial distance. You body will be under stress and you will need more oxygen. Such breathing technique will help you gaining more oxygen. You should remain very relaxed while running. If you are running with a tense mind your breathing will not be very smooth. If you are relax and focused you can breathe in a relax manner and deeply. Only a relax mind will help you to breathe deeply and it will allow your lungs to take full breaths of air which will result in more oxygen. You can see that experienced long distance runner remained very relax while running which also helps in better breathing. Even at the cost of repetition I will tell you again to take long and deep breathes while running. This is a very important aspect of your breathing technique. This will help to ensure that you are getting enough oxygen for your body. This is also the best way to prevent muscle and lung fatigue. It also helps increase endurance by getting proper oxygen circulation to your muscles. Such breathing will help you to remain fresh even after running very long distances. I want to tell you that just by following proper breathing technique you can improve your running and stamina a lot. It may sound strange to many of you. However most of the experienced runners follow a breathing pattern or rhythm. They coordinate their breath with their steps. Popular pattern is inhale for 3 steps and exhale for 2 steps (3 – 2 pattern or rhythm). Similarly you can adopt a pattern as per your convenience such as “2-2” or “2-3.” Try to run with different breathing patterns to find the right one for you. If you are running long distance you cannot run fast all the time. You need to vary your pace to maintain your breathing pattern. Slow down your pace or even walk for some time if you are breathing too hard. Also take a talk test, if you are able to speak full sentences comfortably it indicates you are running at a comfortable pace and breathing properly. Conclusion: I am sure that after reading the article you are now aware about how to breathe while running long distances. Long distance running or marathon is something which requires a lot of practice and focus. Do not just run rather run properly. The purpose of running is to remain fit and enjoy it. Following the steps above will not only improve your performance, but will put less stress on your body and reduce your risk of injury. Therefore follow correct breathing techniques which are essential for running.